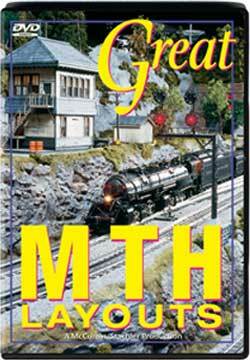 MTH has made a big impact on the O gauge model train market. In the early 90s sales skyrocketed to over $60 million. This dramatic growth has been fueled by the emergence of a new breed of model railroaders called "Hi-Raiders" (layout builders who want the dependability of three-rail operation with scale model accuracy). "I wanted my new layout to be realistic," says Tony Lash, whose spectacular 70x45-foot layout is featured in this video, "and I didn't want anything that looked like a toy. MTH filled my needs." Tony's layout is museum quality. Featured are Premier steamers, diesels and rolling stock, including the Berkshire, Big Boy, Shay, Y-gbs, SP Daylight set and many more. Another highlight is the trees - $60,000 worth. Tony commissioned the best scale model and scenery makers to create a truly spectacular, finely detailed layout. Be prepared to be amazed. Also featured is the new MTH showroom layout which includes an interview with MTH President, Mike Wolf, plus a two-level, scale detailed layout custom-built under the direction of internationally know designer Richard Johnson. Two layouts - one, an exquisite three-rail scale layout that pushes the hobby to new levels; the other, a time machines designed to take its builder back to the days when he was a boy playing with electric trains. John Shankland incorporates the ideas of model railroad legends John Armstrong, Frank Ellison, John Allen, and Dave Frary to create a layout that not only raises the bar for scenery, but features prototypical railroad operations. The emphasis on Steve Scholl's layout is all fun - lots of trains running and just about every accessory. chris collins (fletcher north carolina) on 2017-11-13 19:02:00.